Easter Gift Baskets – Not Just For Kids! Easter tends to have a more kid-friendly connotation to it, what with the cuddly Easter Bunny, kid’s Easter egg hunts, and of course all those scrumptious chocolates and candies. Us grown-ups can appreciate the Easter bunny, have fun at Easter egg hunts, and happily enjoy chocolate candy, so who says we can’t send and receive Easter Gift Baskets for Adults?! After all, age is only a number; and we’re of the mindset that chocolate is even more delicious as we age! Lindt Easter Gift Basket – Now, we’re not saying the kids won’t love Lindt chocolates, but as an adult, we know the Lindt brand and tend to well, adore it. An entire Lindt chocolate bunny? Oh, oh my. Ghirardelli Easter Basket – The kids are mighty pleased with their Snickers and Cadbury, but us adults have more refined chocolate tastes. Sure, we’ll snag a Kit Kat from their Easter basket, but Dark Raspberry, Almond, Luxe Milk, and Hazelnut Ghirardelli Chocolate Bars? Easter is my new favorite holiday! Sweet Easter Basket – What was the first thing you did with your Easter basket on Easter morning, as a kid? Ripped it open, of course! As an adult, we tend to appreciate the nicer things in life – like the pink and green cherry blossom container that holds the raspberry tea cookies and keylime taffy chews in our Sweet Easter Basket. Perfect for holding all of those little items, like our keys and pens, that would otherwise have a tendency to run away on us! Easter Gift Tower – want to send or receive the ultimate Easter gift basket for adults? Our seven-tiered Easter Gift Tower is absolutely mouthwateringly delicious. It’s filled with seven layers of scrumptious goodies – from lemon drops to white cheddar popcorn to perfectly baked cookies. So who says kids have all the fun? We think Easter can be just as fun as an adult, so inject some extra fun in it this year for you and the fellow grown-ups, and gift Easter Gift Baskets! Many of us have treasured holiday traditions – like enjoying Christmas Eve dinner together, whipping up pork on New Year’s Day, and filling an Easter basket with candy treats and Easter dinner goodies. We decided to do a bit of research on some of the common Easter Gift Basket traditions out there, and were so pleased to see such rich tradition only continuing – it’s really interesting! Blessing Of The Easter Basket – Eastern Europe brought us the Christian “blessing of the Easter basket” tradition that was brought to the United States by Polish-Americans. Many Christians would gather together before the Easter holiday in their respective churches waiting for their priest to bless their Easter baskets. Many churches continue to recognize the importance of this tradition and do have blessing of the basket services. A newer tradition has been to include Easter chocolate goodies, such as those hollow chocolate bunnies we all love and adore, along with any kind of special jewelry or mementos. Easter Bunny and Easter Eggs – The depiction of a large bunny delivering Easter eggs on Easter morning is another time-honored tradition. The Easter bunny – and eggs – are both symbols that reflect the Springtime sense of renewal and fertile soil. We just happen to include a bit more chocolate in our Easter Gift Baskets these days! In a world so full of change, it’s refreshing to see wonderful Easter traditions still being continued. 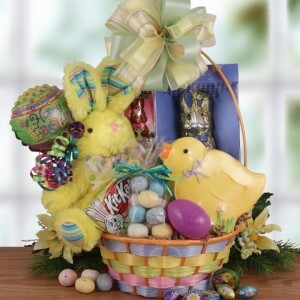 We’re all for new traditions being created and added in, and we hope you’ll make choosing a beautiful Easter gift basket from BisketBaskets.com one of them this year!